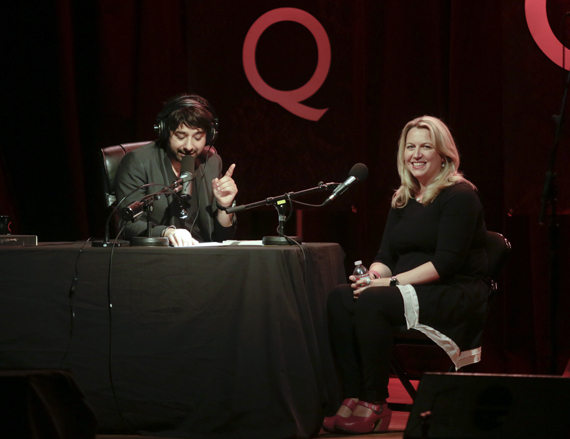 It has been exactly seven years since Canadian broadcaster, producer, writer and musician Jian Ghomeshi founded and launched his multimedia talk show turned international phenomenon, Q, for the Canadian Broadcasting Corporation (CBC). Owning the airwaves for two hours daily on the CBC, with a truncated hour-long version airing on PRI in the States, Ghomeshi and his Q team have taken Canada -- and now the entire continent -- by storm. The Washington Post recently called Q "the most popular new arts and culture radio show in America," and one only has to listen to this brilliant man speak for a few moments to understand why. Ghomeshi has interviewed thousands of people, including Jay Z, Al Gore, Leonard Cohen, Woody Allen, Van Morrison, Joni Mitchell, Paul McCartney, Neil Young, Barbara Walters, Tom Waits, William Shatner, Margaret Atwood, and Salman Rushdie, and who can forget this viral video of Jian's interview with Billy Bob Thornton? 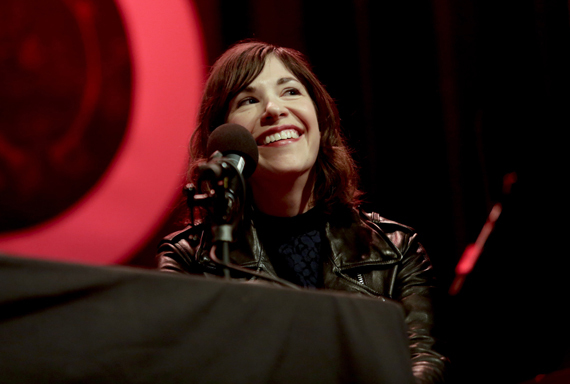 This past week Jian Ghomeshi flew to Portland for a live taping of Q at the historic Aladdin Theater with PDX locals Carrie Brownstein (Portlandia, Sleater-Kinney), Cheryl Strayed (author, Wild), Portia Sabin (Kill Rock Stars), Camas Davis (Portland Meat Collective), Daniel H. Wilson (author), Colin Meloy (The Decemberists) and The Thermals as guests, and I was invited to attend the sold-out show as Q's guest. With a lineup like that, it's no surprise that the event sold out. 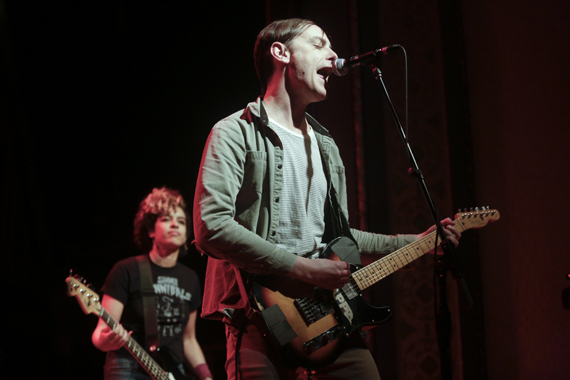 However, it might surprise you to know that Q Portland sold out weeks before the guests were even announced. 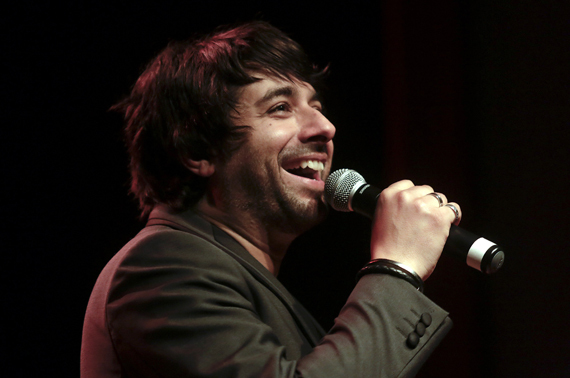 All those people had purchased tickets just to see Ghomeshi; the guests were an afterthought. That's some serious celebrity muscle-flexing, folks! Jian Ghomeshi has the upper hand. Pay attention. A few days before the Q Portland event I chatted with Jian over the phone about the show, fame, sexuality, racism, mental health, supporting LGBTQ equality, marijuana, Russia -- you name it, we went there. He was open and honest and somewhat shy when it came to talking about his accomplishments -- something I don't encounter often during these types of interviews but found extremely refreshing. The night of the show I arrived early, and there was a huge line around the building. I was covering the event, so I went inside and was greeted by one of the show's producers and shown to my seat in the front of the theater. I was also given access to a section of seats on the stage where I watched some of the musical performances during the night. As the doors opened to the public, I was struck by how excited people were, and I began to get a sense of just how beloved Jian Ghomeshi is as public figure. These fans were rabid. Now, I've seen rabid fans do the rabid-fan thing before, but the combination of Ghomeshi's good looks, brains and rock-star sensibility makes for a really intense post-show meet-and-greet frenzy. People go nuts for this man. It would be impossible to capture the special feeling of the night in a blog post, and thankfully you can listen to the whole thing here on the Q site, so I don't even have to try, but there are a few things that didn't make it into the show segments but which you should absolutely know about -- not the least of which was Jian giving me and Queer Voices a shout-out from on stage! 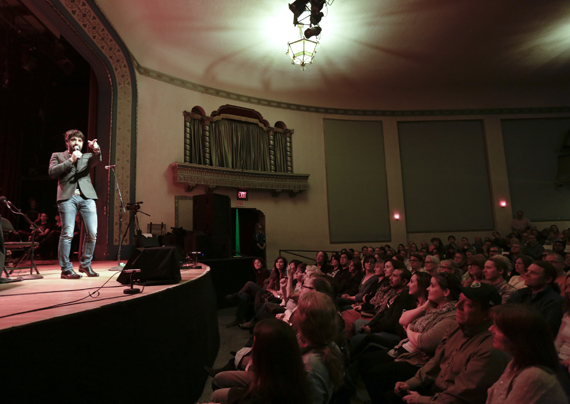 Just before the show began, Ghomeshi took the stage to boisterous applause and immediately started in with a hilarious, personal back-and-forth with the audience, talking about Portland's foodie culture and humbly presenting some general housekeeping-type items to the group before the cameras started rolling. At one point he asked if there were any Persians in the audience, and someone in the balcony responded. Ghomeshi then said something to the person in Farsi, which he followed by explaining to the audience in English, "I said, 'Death to America.' We Persians say it to each other as a greeting." The line got a big laugh, but that self-deprecating humor is rooted in a very real, very painful personal history of experiencing racism -- a history Ghomeshi recounted in his memoir 1982 and continues to reclaim with every empowering jab he takes at the bigoted culture that would easily classify him as a terrorist rather than a gift to the world. Over the course of the evening, I was completely taken with Ghomeshi's grace, his thoughtfulness as an interviewer, and his care in digging for truth. Even in the midst of talking about the slaughter of animals with the Portland Meat Collective (a subject he was clearly squeamish about and perhaps takes ethical issue with), he remained present, polite, charming and engaged in a way that kept us voyeurs and listeners engaged as well. The bottom line is this: Jian Ghomeshi is using his soothing voice and far-reaching platform to move the needle for those who might not otherwise have a voice in media. He and his Q team work daily to change the cultural conversation around politics, music, human rights and how we are actually meant to be together as people... and from what I can tell, it's working. Read my interview with Jian on Queer Voices. For more on Jian Ghomeshi, visit his website, or follow him on Facebook and Twitter.